If you are a beginner and searching for a quick & complete tutorial on how to create a website, then you are in the right place. In this post, I made a guide for building your own website from beginning to end using Weebly website builder. You no need to confuse anything. Just follow the below steps. 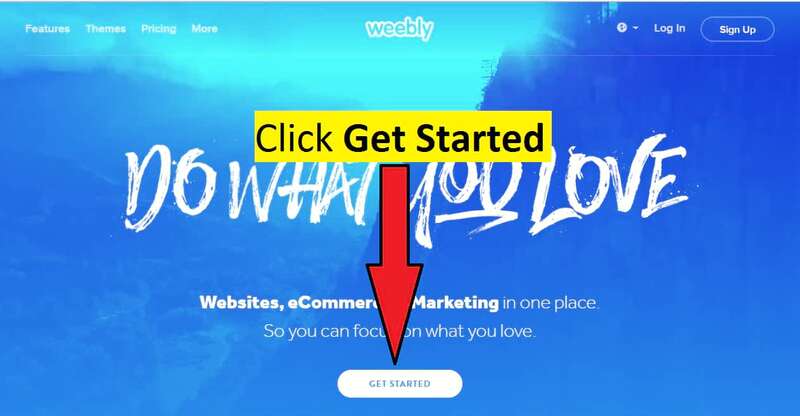 Go to weebly homepage & click on get started. Once you clicked on the Get Started button, you will see a question What Type Of Website You Are Creating? The options are the Online store, Business, Portfolio, Personal, Event, Blog & Other. Click which one fit for you. Don’t worry. Later, you can change it anytime. Once you clicked on an option, you will see continue button. Click on Continue. After, you will see another question: What is the name of your website? Type what name you want to give your website. 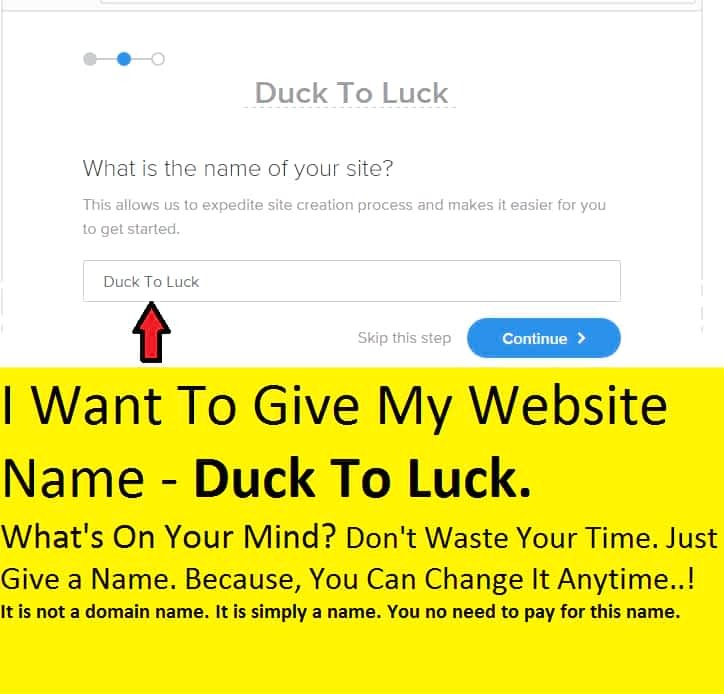 I gave Duck To Luck as my website name in the below example photo. Name your website. It is not a domain name. What’s on your mind just type that name. Don’t waste your time. Because, you can change it anytime. It is not a domain name. It is simply a name. You no need to pay for this name. Once you typed a name, click on Continue. You will see a few templates (Ready-Made websites) related to your topic like online stores, business or personal. Click on any template you liked. 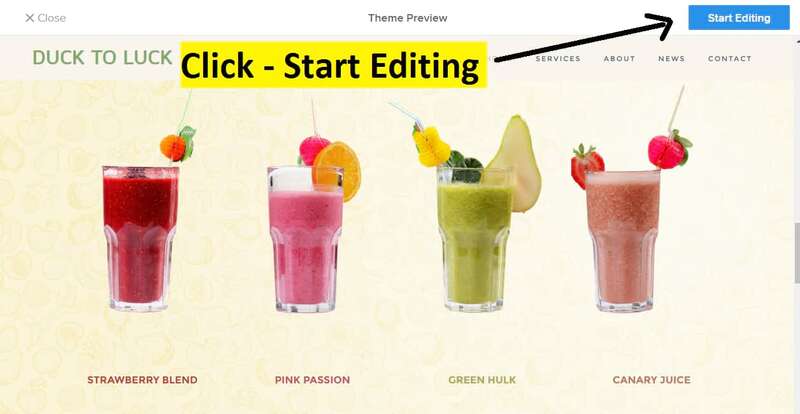 Once you clicked on start editing, your site builder will load on your screen. See below screenshot. Here you can edit, delete, upload, modify anything into anything..!! You no need to learn any skill. Without knowing anything, you can do everything in a few minutes. Click on any text to edit or delete it. Drag & drop any element to your web page. Drag & Drop element box to web page or right side to add text, images, map, button, slideshow etc. 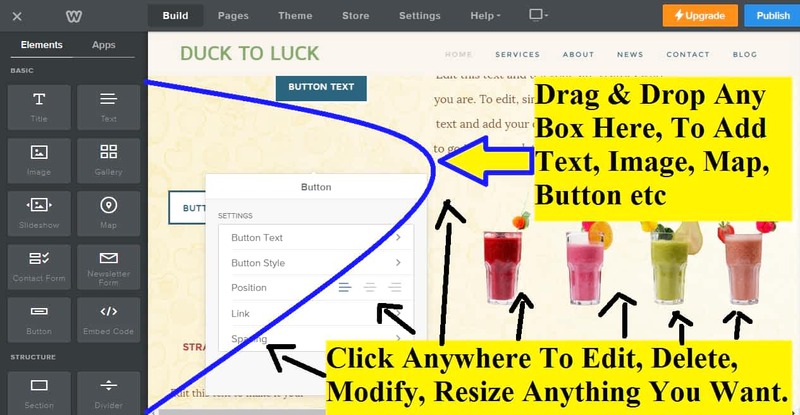 Click Anywhere on the web page to add, edit, modify, replace with text, images, map, buttons and more. Drag & Drop element box to the web page or right side to add text, images, signup form, map, contact system, Gallery, button, slideshow etc. You can also take the help of structure functions like section, divider, spacer. For example, if you want to add a photo, just click and hold on the image element (The box showed with blue arrow mark on the below screenshot) & slowly move your mouse with holding. 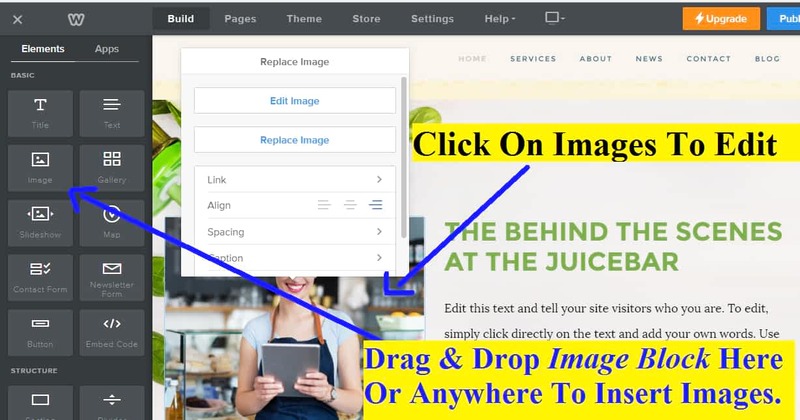 If image box doesn’t move with your mouse movements, then try again by click & hold without leaving your mouse button finger drag & drop that box into the right side web page. So it will automatically add image block. there you can add any image. In Weebly website builder image function is flexible. You can drag & drop the image block to insert new images & also you can modify, edit, replace, color shading and many more things withing your inserted images quickly. On any Weebly template editor, you can drag & drop the image block to insert images anywhere on your webpages & click on existing image to make further modification like replacing, enchaining, color shading, resize, position changing, adding text above the picture, adding effects, opacity, fade, crop, rotate and many more things you can do. You can give the link to your pictures. You can add the caption, Alt text for SEO purposes. If you scroll down on Elements, you will see more function boxes. 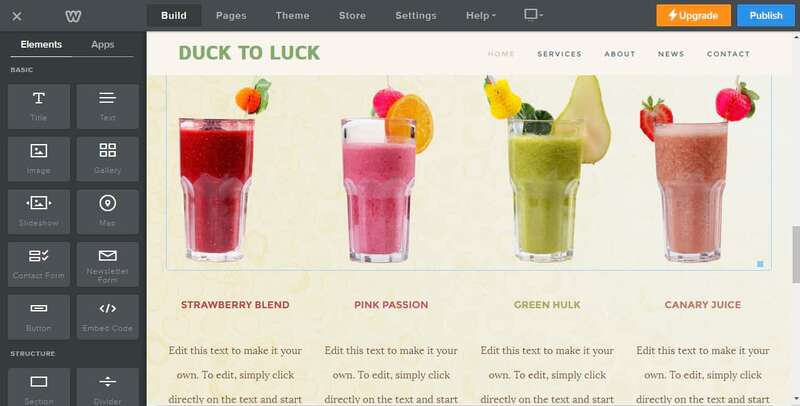 Weebly provides you many functions or elements to build amazing websites. Weebly elements included HD video, Youtube, Audio, file, document, flash, eCommerce features, products, categories, stores, search box, block quote, social icon, RSPB forms, survey. Google Adsense, Feed reader. You can build a stunning website using these functions. You can add unlimited pages on Weebly website. It included many types of ready-made pages – standard page, blog page, store page, external page & non-clickable menu page. Upgrade & Publish Your Website To Get Appear On Google & All Search Engines. You need to upgrade your website to get your all site pages or posts appear on Google & all search engines. If you don’t upgrade your website, then your all work will simply get waste. Because people can’t get your website, even they type exactly your website name on Google or any search engines. So no one can’t able to see your website. Once you click on Upgrade button, you will see a payment form with its plans. Below is the screenshot. Choose Any Weebly plan that fit for you. 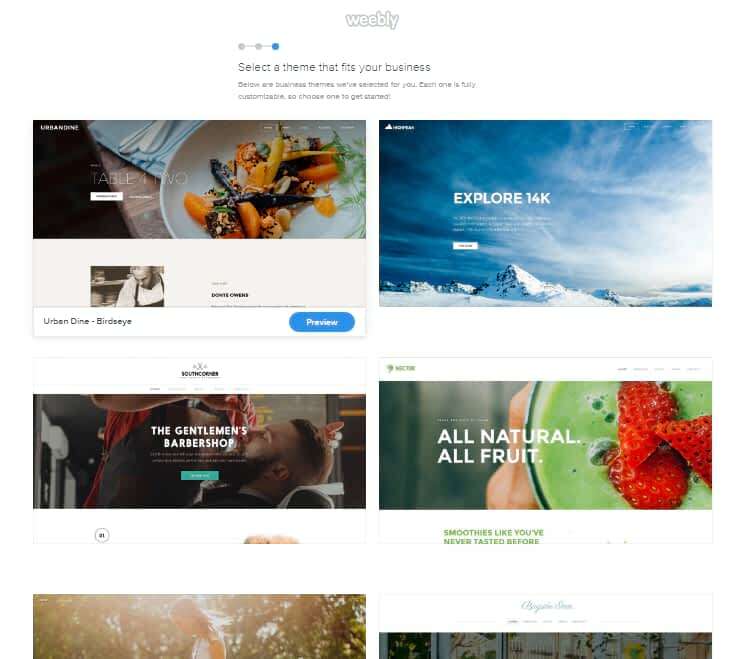 Weebly offers 4 plans. Prices vary for different plans. The Pro plan is the best & cheap. If you are a beginner, then I highly recommend the pro plan. For eCommerce features or If you want to sell something, then choose the Business plan. 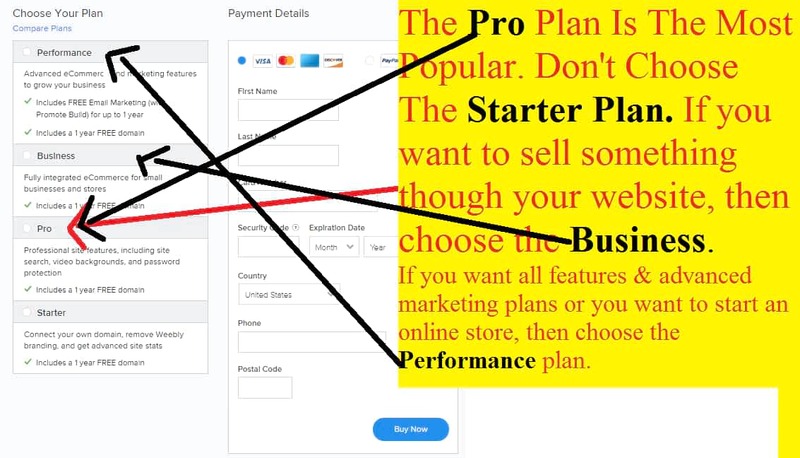 To start an online store buy a performance plan. The Pro plan is the most popular. I recommend it. Don’t choose the starter plan. Because that is really terrific. If you choose the pro plan for 1 year, you need to pay $144. If you choose the business plan, its bill will rise to $300/year. For the Performance, plan price is $588/year. you can pay $59 for 1 month. (Anytime you can upgrade or downgrade or switch between any plans to any plan. But if you downgrade, you may lose many functions those already existed on your website. This may cause many errors on your website. )After you paid, you will get a congratulation message and all billing & your account information will send to the email address that you used to signup for Weebly. 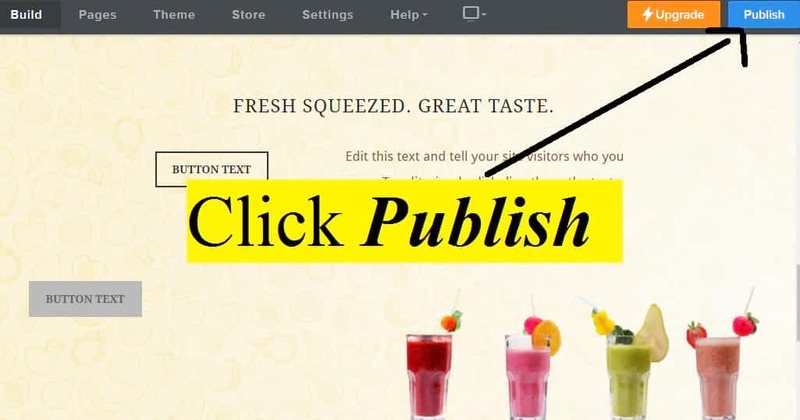 Return to your site editor & click publish button & get a free domain name. Click Publish to get your website Online. Get premium domain name. Don’t choose sub-domain name. Type the name you wanted to give your website. If that name is available, make it your domain name for your website. Most of the time catchy names are not available. Because Someone may already take that domain name. For example, I wanted to give this website name as DuckLuck dot c0m. but that name is already taken by someone. So I searched many different names like DuckyLucky and DuckLucky etc. Finally, DuckToLuck2.com is available. So I registered that name. Don’t think too much. Just give a name that will fit your website. If you find a green right mark, then click continue. You will see a register button. Once you registered your domain name, you can share your website address with your friends. To get appear on Google, you need to wait at least 1 week. You can modify, changing the template or any changes will take even though you published your website. If you change any pages, then all your website visitors see the changes. Make your own website, publish it & Get success, not in the dream, but in the real life. Expose. Explore. Good luck. If you got any problem, comment below, I will help you within 24 hours.